The orders that were made by the ED doctor are completed, and the results are gathered in due course. After the results are back, the ED doctor completes the diagnosis and on going treatment (which includes a new medication) and a referral to the outpatient clinic. The patient is discharged. Following discharge from ED, the patient is seen in the outpatients clinic for a few months until eventual discharge from that clinic as well. A reference to the patient (the subject). If we want to specifically record the reason for each encounter (e.g. triage, initial assessment etc) , then we can record that in the reason element (which is a CodeableConcept). dischargeDiagnosis. This is a resource reference, so we’d most likely create a condition resource (peptic ulcer), and reference that. The condition resource has elements for properties like certainly, severity, evidence and so forth that might be useful. It also has an encounter reference that we can link back to the encounter so we know when the diagnosis was made. One question is whether we have an encounter resource for the registration clerk. From a clinical perspective it’s not necessary, but local policy may require that to be recorded as well. The Outpatient visits would also have encounters – but these are likely to just be single encounters rather than multiple ones. So the encounters form the ‘backbone’ of the record – how to record the actions and observations that were performed/noted? We definitely want to be able to reference the encounter from the observation. While the observation does have a reference to the person who made the observation (the performer) we do want to be able to aggregate at the encounter level as well. We noted this in the previous scenario – so we either use a common extension or we add an ‘encounter’ reference to the observation. (Note that the direction of the reference is from observation to encounter – not the other way around. If it was from encounter to observation we’d need to be updating the encounter very frequently so it’s better this way. Having said that, another possibility might be to have a ‘details’ extension on the encounter that references the observation). There were a number of Orders made throughout this encounter. Some of these were for treatment (IV fluids, Oxygen, pain relief) and some were for investigations (blood tests, a CT scan). 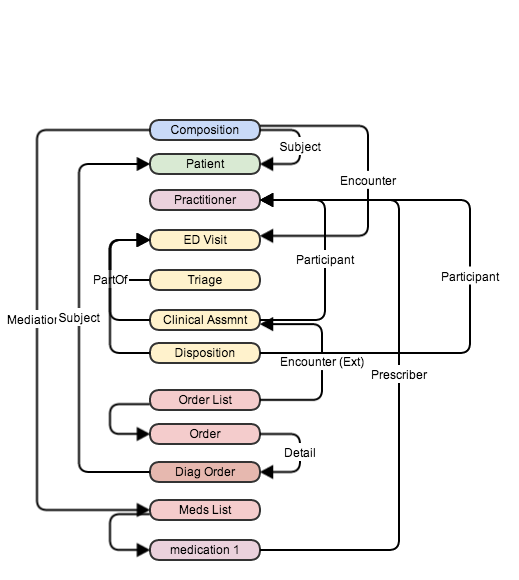 In FHIR there is the Order and OrderResponse resources that manage the workflow involved in these activities, with the details of the actual order being indicated by resources within the order (in the detail element – DiagnosticOrder for the investigations and MedicationPrescription for the treatment). Again we might want to be able to link these orders back to the Encounter where they were generated so either a standard extension or an update to the Order resource is required. The results of the various investigations can be represented as DiagnosticReport and ImagingStudy. It’s unclear whether these require a specific encounter link – and this will probably depend on the specific implementation. The referral to the Outpatient clinic would be another Order, with the new Referral resource (under development) as the detail property. So having collected the resources for this scenario, how do we package it to send to another provider (like the patients primary care provider)? Well technically it’s quite straight forward – this would be a FHIR document (as it’s a summary of a clinical encounter) consisting of a bundle (atom feed) with a Composition resource as a header (like in CDA) and containing the ‘section’ references, and all the resources as contents with internal references as required. Easy. So what we need to do in our document is to add the required sections in the composition, and from there refer to the appropriate resources – either directly or through an intermediate resource like a List (for example, in the medications section we’d probably refer to a List resource which in turn refers to the actual MedicationPrescription resources. This has the added advantage that it allows us to list all of the patients medications – not just the one we added – and even record updates to the list, like a discontinued medication). And the Composition has an entry for encounter that we’d use to refer to the ‘parent’ ED encounter, which also has the references from the other encounters. In real life we’d probably only include a summary of the ED visit rather than all the detailed interactions that there were – but it’s nice to know we have the option if we want to! So to wrap this up, we’ve looked at our second clinical scenario to see how it could be represented in FHIR. Like the first one, there are no obvious gaps, though a more detailed analysis might be needed to confirm this – and the scenario does include a referral – and that resource is currently in development. We used multiple encounter resources to separate out the different contacts with a clinician – perhaps a bit over the top as there are other ways of linking activities to the person who performed them. Can you please elaborate on the following statement – “While the observation does have a reference to the person who made the observation (the performer) we do want to be able to aggregate at the encounter level as well. We noted this in the previous scenario – so we either use a common extension or we add an ‘encounter’ reference to the observation. Currently an observation (http://www.hl7.org/implement/standards/fhir/observation.html) does not have a ‘encounter’ reference so how would you be able to add this reference? When you say “use a common extension”, is this an extension that currently exists?